In between the multiple emails I get about the stupid-assed Cookie Diet and the weird-assed Pimple Blocker Battle events, I occasionally get emails asking me whatever happened to my Lick the Produce entries where I’d try new fruits and vegetables. Well, the produce section done been licked, y’all. The Kroger is bathed in my saliva. 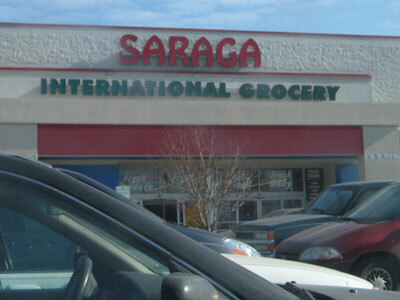 But, since you seem to like my tongue-based adventures I decided to drive across town for new material and visit Saraga, the international grocery. Saraga is cold and quiet. The cashiers wear mittens and coats in the winter. An unsettling quiet blankets the store because no music is piped over the speaker system. I don’t know if they can’t afford a PA system, or if they don’t want to play music from any one nationality for fear of alienating another culture. I suspect it’s because they’re cheap. It’s more fun to look at the items at Saraga than to actually eat them, especially after reading these reviews about how dirty and unclean the store is and how they allegedly rip people off and switch labels on items. I do wonder how long the items had been sitting on the shelf. How much pocky can they really sell in a week? And how frequently do chayote shipments come in? Saraga isn’t close to my apartment, and it’s located in a somewhat sketchy part of town, so I don’t visit there often. I usually want to leave about 10 minutes after I do because of the cold and the quiet and the creepy food, like the Bulgogi above which looks like it crawled out of the primordial ooze and is about to gain self-awareness. 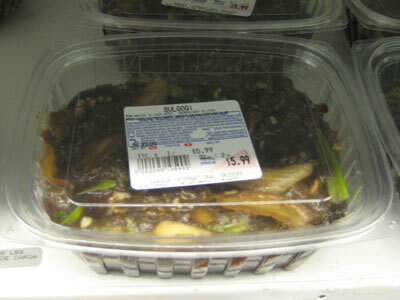 Reading the description of bulgogi on Wikipedia makes it sound tasty, but my eyes can’t get over how gross it looks. I searched for the corn and cheese flavored ice cream I saw there last year, but couldn’t find it. Which means someone actually bought it. I can only hope that like me, they were a blogger searching for material. I bought two weird fruits to review…and then I let them sit in my fridge for over a week. Spiky fruits are scary, ok?! So, you’ll have to wait a bit longer for any new “Lick the Produce” entries. Out of curiosity, I also purchased two of the bean cakes pictured above, expecting a pastry made with red beans to be one of those items I chewed three times and then spit into the trash as a masticated ball of goo. Imagine my surprise when it was tasty! Really tasty! 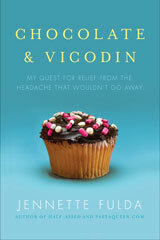 Proving once again that if you inject something with enough sugar, I will probably eat it. Visiting Saraga made me wonder what American foods seem odd and gross to foreigners. Whatever they are, they can’t possibly sound as bizarre as fish paste. ETA: Recently some people have reported problems when trying to leave comments. If you run into a problem, please email me with the text of your comment, your computer’s operating system, and the browser you are using. Thanks! great question and great theme! in the states i was grossed out by a product in what was apparently the dairy aisle called ‘ham flavored cheese food’. the ingredients did not include milk or pork of any sort. I was also served scrambled eggs made from some sort of instant powder. at the time scrambled eggs was the only meal i knew how to make from scratch so i was mystified by the need to have invented such a thing. i’m not sure the above can be called American food, but it was food in America. I’d definitely not buy produce from them! 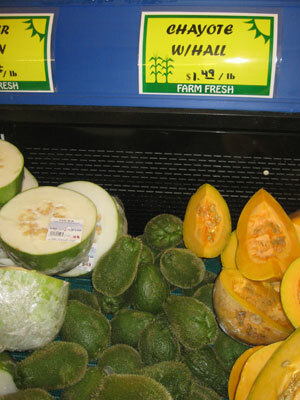 I buy chayote all the time and I’ve never seen it look like that–maybe there’s a variety that has fuzz on it, but I’ve never seen it! Also, that aloe is no where near “fresh.” I havea couple of aloes in my yard and, trust me, the only part that might look like that are the lower leaves or fronds or whatever you call them that you pull off because they’re at the end of life and dying. I once and only once went to our local international market. Ours is also, cold, quiet, and dimly lit. I brought my hubby because it happens to be in a sketchy part of town. I was trying to make some of the authentic Asian recipes my friend Susan was teaching me. She was born and raised in China until 2002. (And her cooking is AMAZING!) I left when I walked down and saw a row of refrigerators displaying whole dead fish and other animal parts floating in glass jars for purchase. It really freaked me out. I ended up buying my bean curd paste and other things over the net. It may have come from a store similar to that one, but I didn’t have to see it. What a fun post! I felt like I went on a grocery store adventure & didn’t have to leave the office (b/c yes, I’m at work. I’m a total slacker). Trying new stuff is so fun! I’m sorry that the store was gross and scary. 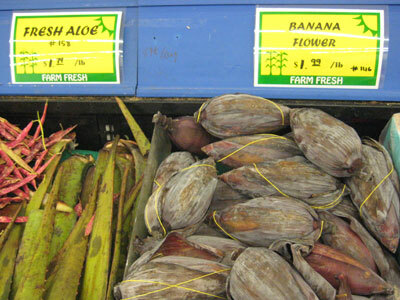 We have lots of asian markets where I live – some of them are great and some of them are not worth the drive. However, when I do make the trip, I always get red bean cakes or pastries or taro root bastries. DELISH! I would advise staying away from the bitter melon that you pictured. One of my oldest friends is Tiawanese so I eat lots of new things when I visit her parents. I’ve had bitter melon. First, it’s a veggie, not a fruit. Second, it’s disgusting. And I’m pretty adventuresome. My friend and her parents couldn’t believe I managed to eat as much as I did, and they all proclaimed that it’s an aquired taste. I just thought I would throw that info out there in case that’s one you wanted to try, thinking it would be a fruit. I have to tell you, Bulgogi from a good Korean restaurant is fantastic! That stuff up there in your picture looks seriously scary though. Oh, I also have to put in a plug for red bean anything. I highly recommend red bean ice cream. Yum! @maxie – Yup, we have lots of aloe plants and fresh aloe has no brown spots! scary food is juuuust scary. I bet non-americans would be grossed out by scrapple (it grosses me out) and help the snack foods my kid eats that have highly unrealistic colors to them. Being an Indy Gal myself I have to say you are an extremely brave soul for going to Saraga let alone eating anything you may have purchased from them! Apparently, Peanut Butter and Jelly is quintessentially American. I’ve heard that foreigners think it’s ridiculously sweet. It’s out of season right now, but in the fall, if you can, I seriously recommend trying persimmons. They’re addictive. Just make sure that if you buy the cone-shaped version, you wait until it’s mushy-soft to eat; if it’s even a bit under ripe, it’s extremely astringent! I’m a Peace Corps volunteer in China, and I teach English to college freshman. The food that my students think is the weirdest, and are absolutely grossed out by, is cheese. Think about the process of making cheese for a second, and then remember that many Asians are lactose intolerant. So not only is it old, yucky, gross milk, but it makes them sick, too. It doesn’t make me any less sad that it’s such a trial to find. But cheese. On other notes, they think that we eat pizza for breakfast, hamburgers for lunch, and steak for dinner. 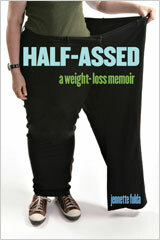 No wonder we’re all so fat. Bulgogi is AMAZING…. but that package does look especially nasty HAHA…. When I taught in S. Korea, that was some of my FAVE food. Hee, I live in Japan right now and things like cor ice cream are very common. Red bean paste (azuki in Japanese) is really tasty though! 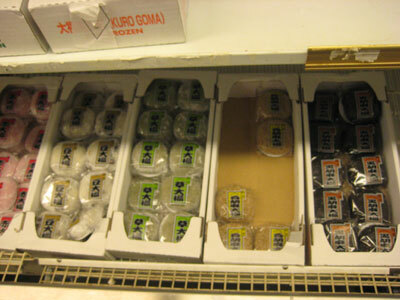 Espeically in mochi (balls made of rice paste). You’re right, spiky vegetables are scary. In the summer you can buy these knobbly cucumbers on a stick as snacks here and even though I know it’s just cucumber I can’t bring myself to eat them. I like to try new grocery stores too, but I’ve had similar experiences where its just a little too out there for me too. And, when you can’t even guess what kind of fruits or veggies it is, you know you are in trouble. I like how you said about the store being so quiet because there is no PA system. I can totally picture that!! 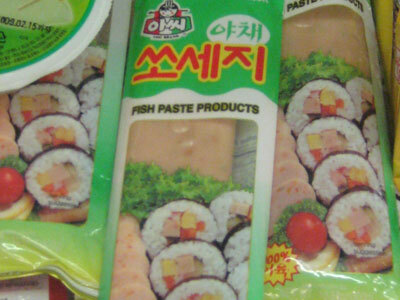 What’s funny is that I live in Korea and see the Bulgogi and fish paste every day. Though there are different forms of bulgogi, I have seen some like that, and the fish paste, I actually see them cooking it up before it goes into the kimbap, soup, whatever they were using it in. And they call it Ah Mook. It’s the nastiest smelling thing ever, right next to the silk worm larvae. Blech. hi! 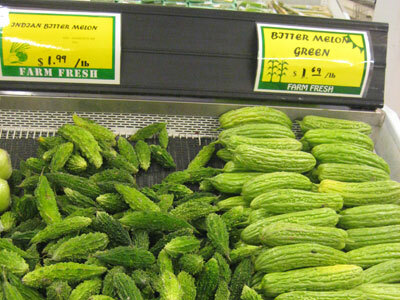 I always try to find some sort of new produce when I go shopping. I like the variety and experimentation aspect of buying something that I have no idea what it is, and then trying to find out how to use it on the internet. Yet… I am all about local food, and most of the unusual produce I buy is not local. But then again, I live in Massachusetts, so there is not much local right now. So, its a trade off- local or variety. hmmmm…. Looking forward to the Lick the Produce! The most unappealing vegetable I’ve ever seen was the “radis noir” available at the Trois Mousquetaires supermarket I used to use when I lived in France. “Radis” means radish, but this isn’t one of the little red things you find in salad. It was over a foot long, looked like a rather phallic offensive weapon, and was usually rather muddy. Have you ever really thought about how cheese is made. It’s fermented ie rotten milk. If you are from a culure that does not eat any milk of any sort, it seems a little gross…milk is just breast-milk from another animal. Cheese is the rotten form. Yogurt is aged milk after being digested by bacteria. And remember most of the world is on a rice based diet, the amount of bread and no rice is weird. In Thailand, when I ate a salad(western style) for lunch by students couldn’t understand how I wouldn’t starve with just a salad and no rice for lunch and they thought it looked a little gross. They would never understand a low carb diet.